Once again, Ruston Paving’s Central NY Division was working at Nob Hill Apartments. 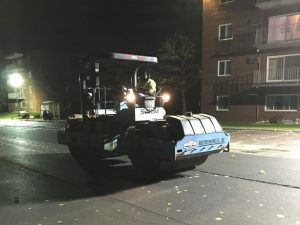 For 24 consecutive years, Ruston Paving has been performing site improvements at Nob Hill, which has earned the distinction of being our longest-standing customer. Nob Hill, which features 761 one- to three-bedroom apartments, is one of the largest apartment complexes in Syracuse and the region.Earlier in 2018, Nob Hill was purchased by Sinatra & Company Real Estate, of Buffalo, in a joint venture with Windsor Capital Group, a hotel management and development company based in Santa Monica, California, and Basalt Capital LLC. Amidst the change, Ruston Paving is proud to still be completing work for the new owners!